Brammo Blog: The Empulse Went Over the Mountain (repeat 2 more times), to see what it could see. As you can tell by the Title: I have been working in Pediatrics too long. I had a nice, totally unintended, test of the Empulse R brakes on Monday. It was the usual culprit: an automobile (Usually a car. This time a pickup). Doing what I consider the most dangerous maneuver that a motorcycle driver has to encounter: Automobile turning left in front of motorcycle. I was heading to work. I was riding at 40 mph in a turn only lane. The thru lane was backed up with cars going straight and one of the cars was “trying” to be nice and let a pickup (with trailer) turn left in front of him since the thru lane traffic was stopped. Sadly he did not think about the second lane where the traffic was moving freely and that I happen to be riding in (and 40 mph is the posted speed limit on this road, so I wasn’t riding recklessly). I noticed the pick up turning in front of me with either 3 or 4 car lengths between me and the space in my lane that the truck would soon occupy. So 50-60 feet? I let off the throttle and applied front brake. I don’t think I even used the rear brake at all. And I stopped. Easily. I thought for sure I would hit the truck (the driver saw me too late and came to a stop totally blocking my lane). I’m pretty sure I would have hit the truck on any of my other rides. The interesting thing is: There was no squeal of brakes and tires. No locking up. No skid. Walter White (the name I’ve given my White Empulse R) just calmly and smoothly stopped in a hell of a short distance. And I think I know why. 2) Perfect conditions. Dry road. Bright morning sun. Mild temps of 70ish. 3) I am a fairly defensive driver. I always assume every car is actively trying to kill me. And they were that morning. 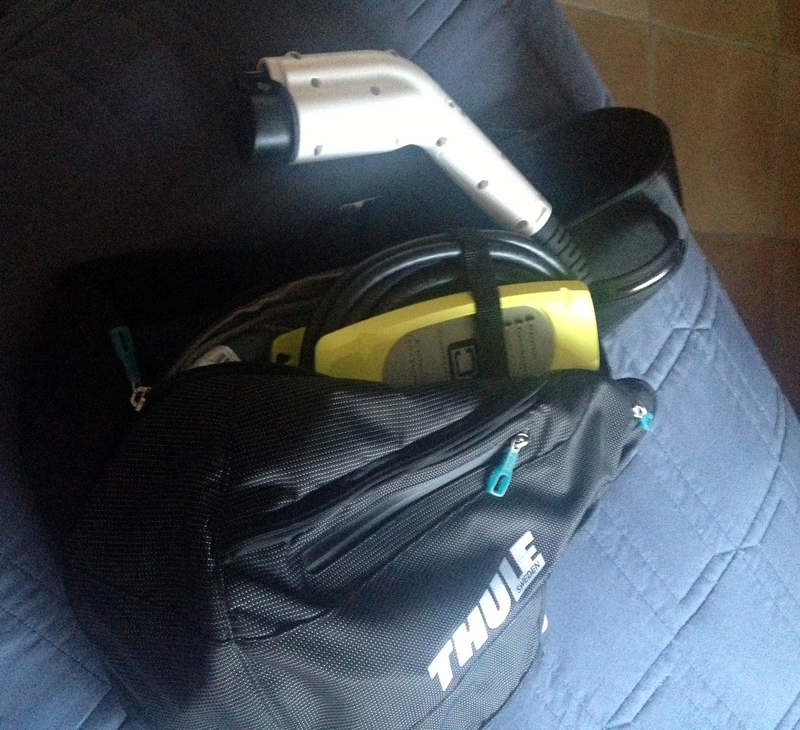 4)…Regen/engine braking. 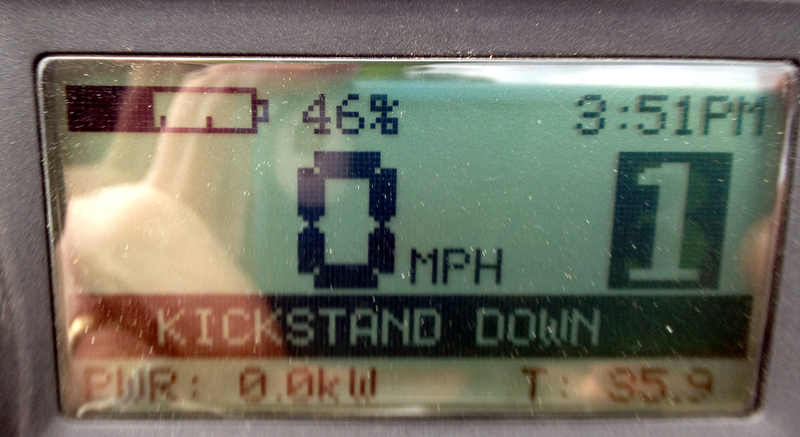 The very powerful engine braking of the Empulse really slows the bike down quickly. And that regen does it without wheel skid or lock up. I think the regen/engine braking really gives the Empulse superior controlled braking in emergency maneuvers. Like all long time riders I’ve had my share of close calls with cars. After the performance of the Empulse brakes, I feel that I have the best tools to keep those close calls from being a trip to the Emergency Room. Thankfully there were no cars behind me in the turn only lane. 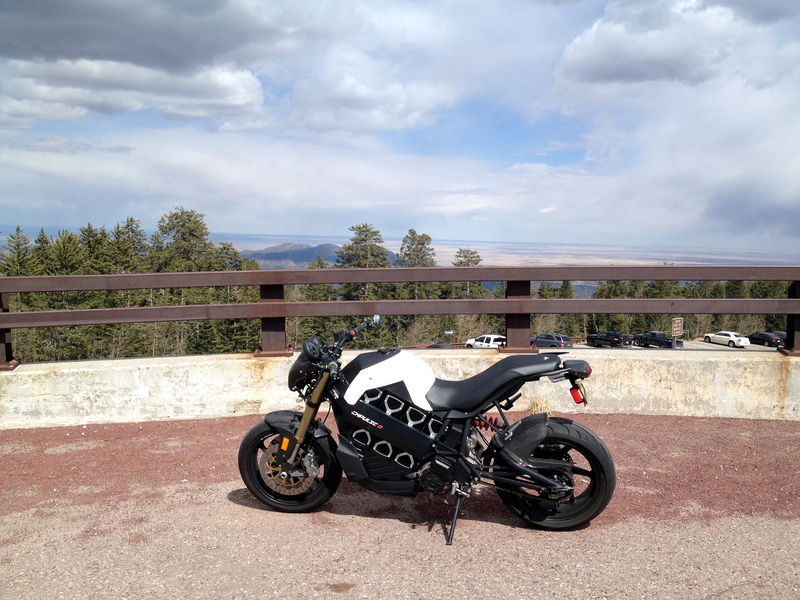 There isn’t a car built that would have been able to stop as fast as I did on the Empulse. I would have avoided hitting the pickup only to be rammed from behind and then crushed between car and the pickup truck. Nasty. I was also surprised how calmly I took it all. No honking or cursing. No single finger salute. It must have been the shock of stopping so easily in a distance I didn’t think was possible. All I did was shake my head at the pickup driver and then turn and shake my head at the driver of the car who waved the pickup through and into my lane. And then I drove on to work. 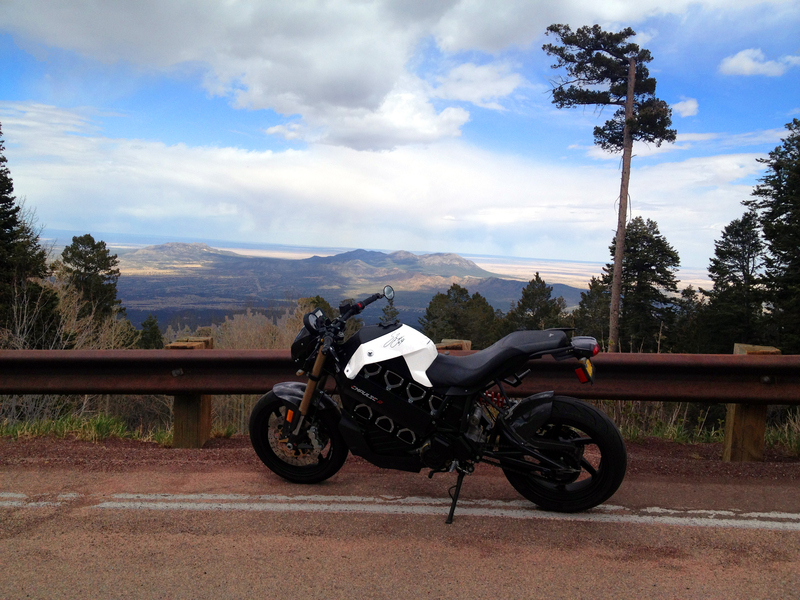 But what I originally wanted to share here was my ride up the mountain. 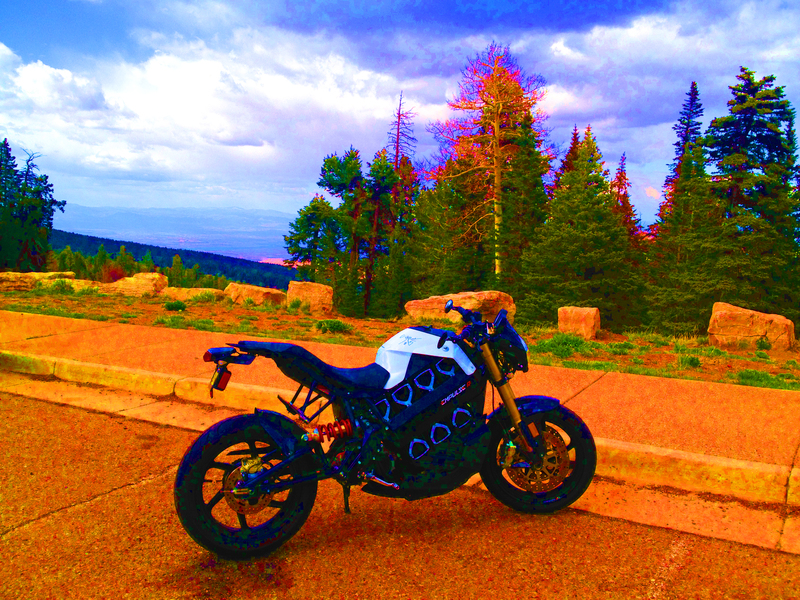 I’ve done this ride on my 150 2 stroke scooter (fun). On my 3 wheeled 500cc MP3 (fun). On the Enertia Plus (fun). And now I’ve done it on the Empulse R (funnest yet). I will talk a bit about the ride and I will talk a bit about the distances and speeds. 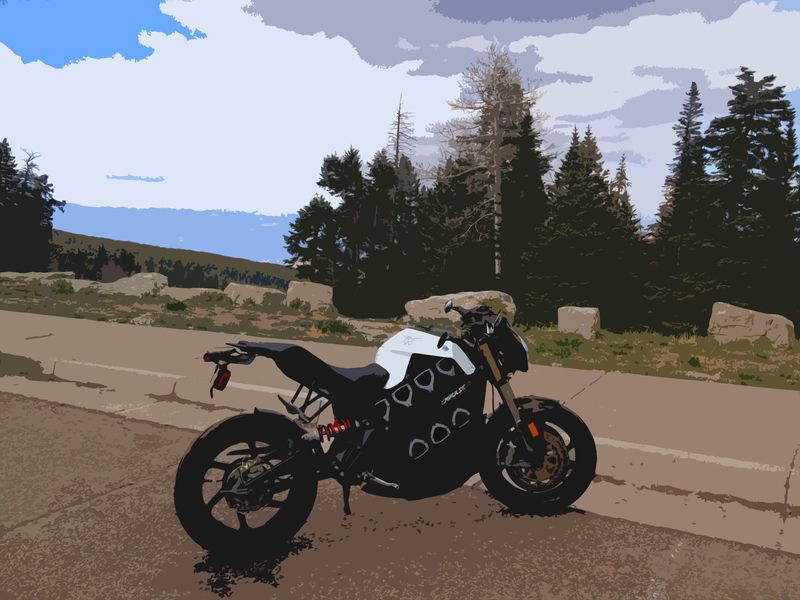 Yes one day I will talk about a road trip and not go into range and all that, but it is still an issue and a concern with all electric bikes at this time…so I will discuss it. But first things first: The Ride. From my house to the top of Sandia Crest. 36 miles. 5000 feet elevation gain. 14 miles of fun, twisty road up the mountain. Beautiful views when you get to the end. When I did this ride on the Enertia Plus I made it there and back fine. 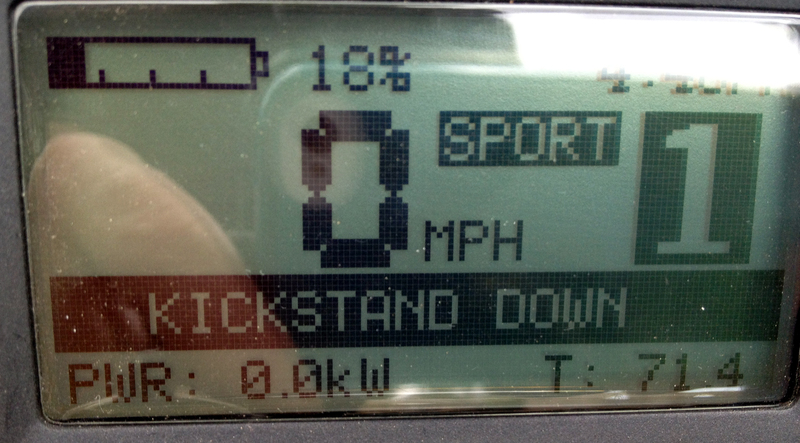 I also, to conserve a bit of battery, went mostly the speed limit of slightly below. 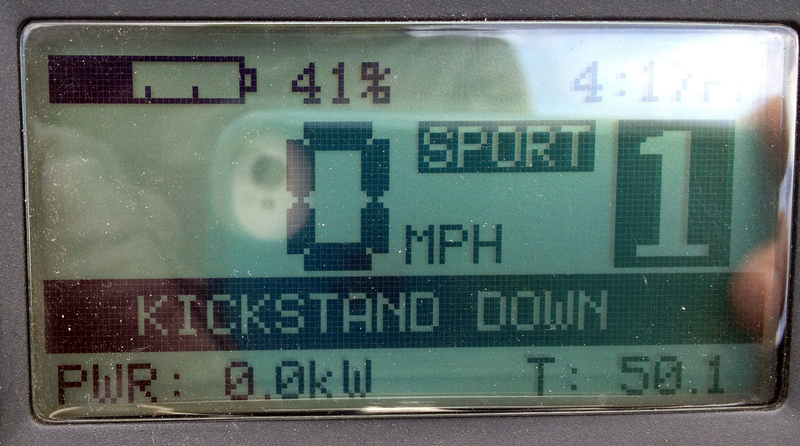 70 plus miles round trip is a bit much for the Enertia Plus unless it is all city roads. And the ride to the crest is not all city roads. It breaks down this way: 7.5 miles of city roads, 14.5 miles of roads that are either 45 or 55 mph, and then those 14 miles up twisty fun roads to the top. After you look around and enjoy the scenery, you turn around and go back. I was surprised and happy that the smaller Enertia Plus could do that round trip pretty easily and I got home with 9% of my battery. Being cautious, I did go either the speed limit or slightly below with the Plus. But she handled well and was fun up the mountain twisties. So how did the Empulse R do on this same trip? Beautifully. My funnest trip up Sandia yet. I left my house with a full charge and, unlike with the Plus, I didn’t baby anything. I averaged a good 10 mph faster on the Empulse R and felt right at home on all the roads: city, country, semi highway, mountain twisties. And boy does Walt tear up those twisties. I took those 14 miles much faster than I ever have…and I did it all on Standard mode as I forgot to put the Empulse into Sport mode. Doh! Sports mode is made for mountain twisties. Grrrrrrrr. Next time. I did use Sport mode on the way down and it was a blast. At the top. 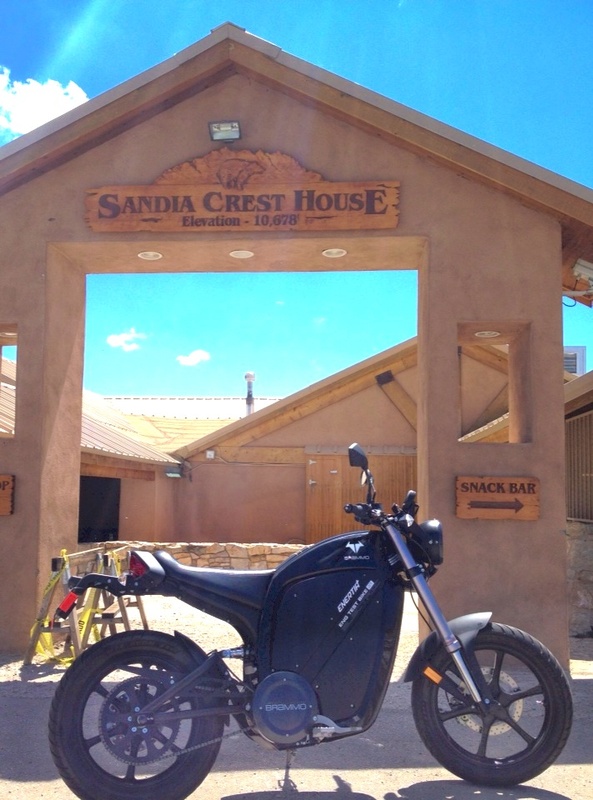 One downside of the larger, faster Empulse: I didn’t feel I could just ride it up the walkway to the Crest sign like I did with the Enertia Plus. So the whole 71.4 mile round trip was super fast and fun. Can’t wait to do it a few more times and really get a nice feel for each on-coming turn. Left the house a little after 3 pm. 36 miles later and 5000 feet higher my battery was at 46%. Sad: note the lack of SPORT on that screen. More heading down the mountain. I used close to 28% of the battery to go fairly fast up those 14 miles. Only 5% to go fairly fast down. 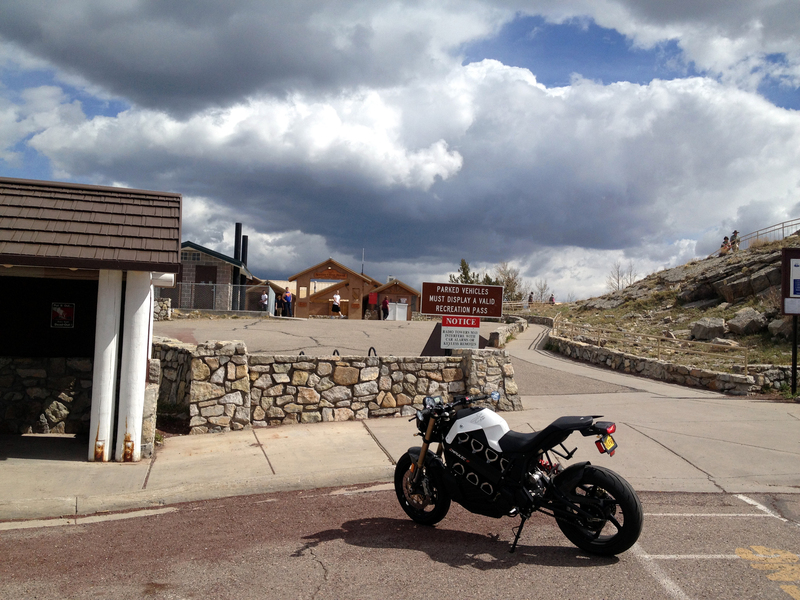 C) Less than 2 hours for this 70 plus mile ride…with Photo stops and a couple of stops for questions. I always get questions when I ride this bike. D) Didn’t go slow or baby the bike at all (though I am not a holligan or hoon like Wes Siler) and still got home with 18% of the battery left. Twice as much as when I took the Enertia Plus. And I did the ride much faster. E) Next time I go without taking the battery charger. I was sure I would be fine…but why take chances? I’m thinking of getting the tail bag just for this beast of a plug. It’s not insanely heavy, but I would prefer not to have it on my back. Boring bonus…Gavin plays with photoshop…what a surprise. Gavin, sounds like fun. The photos are my favorite part of course. Very different sky from the earlier trip but much more interesting.